Back in April 2012, we inherited 635 hectares of land and became one of the largest public sector landowners in London. The Mayor pledged to release all the unused land for development. 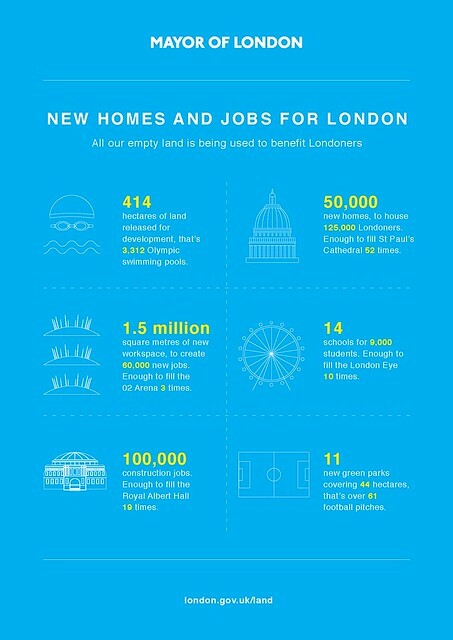 This would encourage investment, create jobs and provide much needed homes for Londoners. All of the developable land now has now been released. This means nearly 50,000 homes will be built across the sites and almost 60,000 jobs created in new workspaces. There will also be new schools, bridges, parks, health centres and community facilities. The sites include London’s Royal Docks, which will host the capital’s next business district and become a hub for emerging technologies. There’s also Greenwich Peninsula, the largest single regeneration development in London.